Anti-Static Pink Poly is a strong, all-purpose packaging film, designed to balance anti-static properties and good handling characteristics with a clean surface. Available pink-tinted in standard thickness of .006” and custom thickness from .002” to .008”. 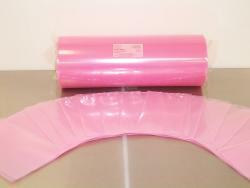 Anti-Static Pink Poly is the film used in AeroPackaging’s stock size program. A/S Pink Poly Tubing is available in widths from 2” to 60” and standard roll lengths of 500 and 1000 feet. A/S Pink Poly Bags are available in flat sizes from 2” x 2” to 60” x 80”. Anti-Static Pink Poly is one of the lowest-priced cleanroom packaging films available, while still supplying the highest level of performance. Fabricated from resin designed for cleanroom packaging when anti-static properties are required. This, plus the quality processing agreements AeroPackaging has with our extruder, ensures the highest-quality films available. As a secondary barrier bag, Anti-Static Pink Poly is an excellent choice for adding anti-static properties to your total cleanroom packaging solution. Looking for Orange Anti-Static Nylon cleanroom packaging? Please click here. NOTE: Anti-Static Pink or Blue Poly is available on a custom basis only. Although an excellent product for its application, it has a very limited shelf life of one year.